Rains in Bangalore usually brings along awesome places to visit around Bangalore. They are just outside of Bangalore in the range of 200-400 km, which makes them perfect weekend getaways. With the rains pouring down and the cities are lying drenched. The landscapes, rivers, lakes and hills from the outskirts of Bangalore beckon us. 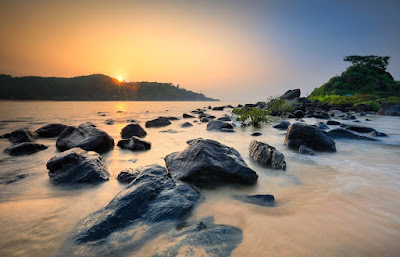 Shivanasamundram, one of the best weekend getaway from Bangalore for monsoons is located on the banks of the river Cauveri, about 100kms from Bangalore. It is also known as Shimsa or Bluff. The mighty Cauveri River splits into two and plummets down 75 metres deep into the gorge. These two twin waterfalls, Gaganachukki and Bharachukki are one of the top 100 waterfalls in the world. During monsoon, the Cauveri River flows with spate and the waterfalls are at their best. Apart from this, you can also visit Raganatha Temple dedicated to Goddess Cauveri, build by the Hoysala ruler and the Hazrath Mardane Gaib dargah. It is also famous for its Hydro-Electric Power Project. 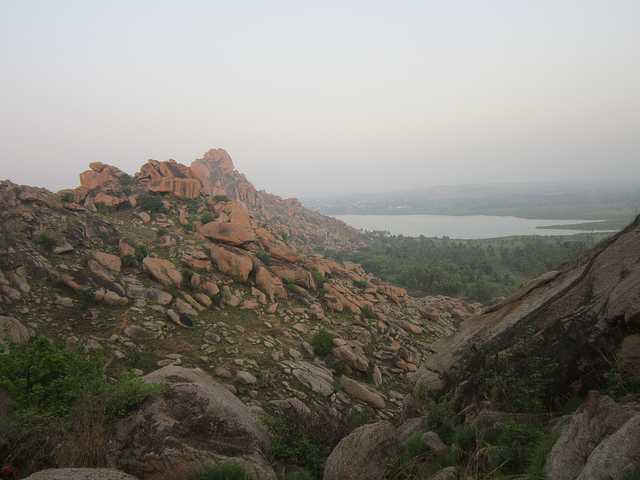 Located 70km away from the city, Anthargange is a great trekking weekend option from Bangalore. Anthargange is made up of volcanic rock formations filled with numerous caves and interjectional streams and springs. Anthargange literally means Inner Stream; it refers to the perpetual stream that flows from inside the rocks whose origin is still unknown. Besides, it’s a haven for adventure sports; trekking, hiking, rappelling, cave explorations, rock climbing, high rope traversing are the popular sporting activities here. Apart from this, monsoons offer a respite from the city heat as mountain takes up a green cover and the caves become cooler. Sunset is the best time to be here as the view from the top is exhilarating. 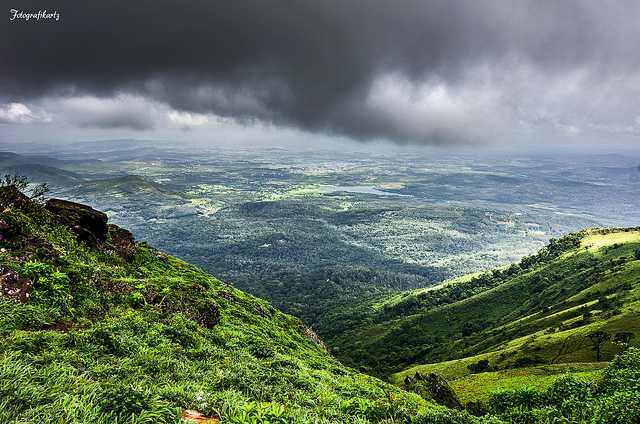 Chikmagalur, located around 250 kms from Bangalore is nestled in the Bada Budan Hills. This quaint little town close to Bangalore is full of valleys, hills, streams and rivers. With its rugged mountains and sloppy hills, it makes for a trekker’s delight. It is also known as the Coffee Land of Karnataka with sprawling landscapes for coffee plantations. Mullayyanagiri range, Kemmmanagundi Hills, Muthodi National Park and Bhadra Wildlife Sanctuary are some of the attractions here. Savandurga formed by two hills – Karigudda and Biligudda is one of the highest monolithic hills in Asia. At 1,226mts tall, it is largely made up of granites and laterites and serves as the perfect spot for adventure enthusiasts in Bangalore. At the foothills, the Arkavathi River quietly flows and the Narsimhaswamy temple is another attraction here. Savandurga hills have many caves formed due to the rock formation which attracts people for Cave explorations, hiking and trekking. The hills are covered in lush greens in the monsoons and make for a pleasant trip. Just outside Bangalore, this little-known Dam situated close to a huge Banyan tree is an easily accessible scenic spot. The shallow lake makes for activities like rafting, swimming and fishing. You can also make your own make-shift raft here and test it out in the waters. 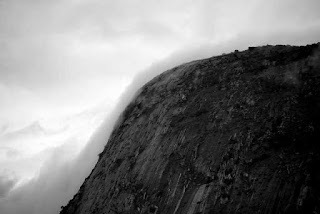 Some hills situated nearby to serve as a good trekking and rappelling point close to Bangalore. 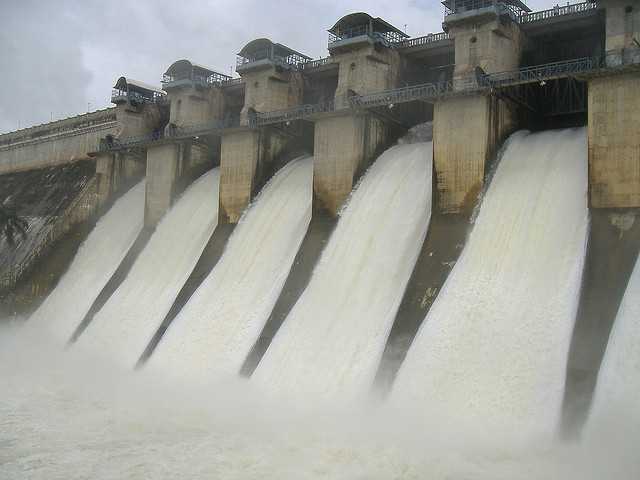 During monsoons, the Machanabelle Dam overflows and it’s quite a sight to behold. 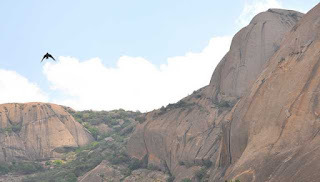 Located about 100km from Bangalore, Kunti Betta is formed by two rocky hills overlooking the city of Padavpura. These hills were also called French Rocks by the British. The locals believe that this place is named after Kunti – the mother of the Pandavas, as she grew fond of this place during their time in exile. The top of the hills offer a magnificent view of the city especially during the monsoons as the place livens up with greens and bouts of colourful flowers, you can also see the gushing backwaters of Tonnur Kere, lakes and farms. Along the way up to the hills, you’ll come across Kunti Kola, a deep rock depression and a large footprint like formation which the locals call Bheemana Pada. 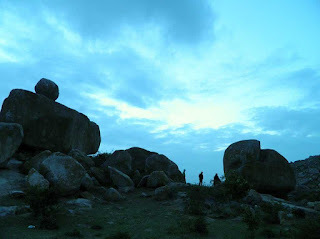 Overall a great trekking spot around Bangalore for the monsoon. 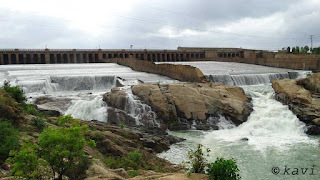 The Gorur Dam built on the river Hemavathi, is quite close to Bangalore and it’s located about 189km from Bangalore. Monsoon is the perfect time to visit this dam but wait till it’s raining heavily. 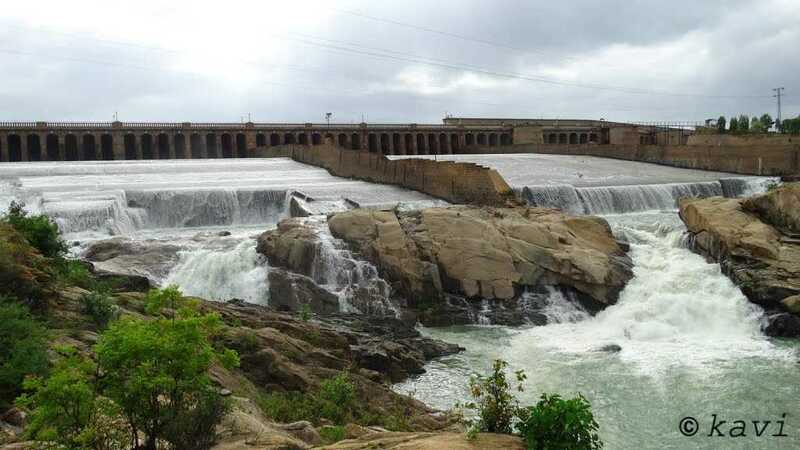 The Hemavathi River flows ferociously while the Dam fills upto its brim and overflows. This is the time when the officials release the water from the Dam; it’s a sight beyond words. The gusto with which the water flows from the Dam leaves anyone watching nearby drenched in cool sprinkles. 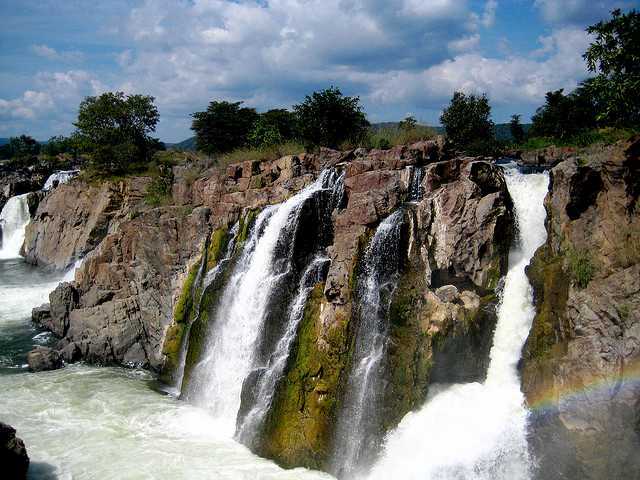 Situated about 180km from the city, Hogenakkal is another important waterfall situated close to Bangalore originating from the Cauveri River. Hogenakkal is derived from two Kannada words together meaning ‘Smoking Rocks’ because of the smoke like mists that fills the air when the water plummets down on the rocks in the gorge. Monsoons make the river flow with much force making the water fall in a much force. People believe these falls have healing properties. 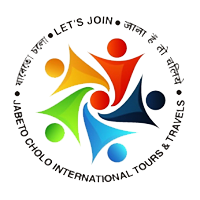 This place is also famous for its massages given by the masseurs on flat rocks near the falls. A bath in the waterfalls after a massage is believed to be therapeutic. There are boats as well that takes you up close to the waterfalls. Located in Chikbalapur Taluka, about 60km from Bangalore on Bellary Road, Nandi Hills was considered to be a summer retreat of Tipu Sultan and the Britishers. The place is famous for its sunset and sunrise points and also for the various Shiva Temples located nearby. The Nandi Hills is favoured during monsoons for trekking and paragliding as well as for visiting the holy Amruth Sarovar which comes to its brim in the monsoons. The hills display a spectacular beauty and cool climate makes for an escape from the City. 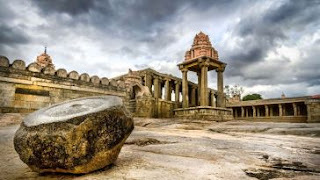 There are some famous historic sites to visit here such as the Tipu’s Summer Palace, Gavi Veerbhadra Temple, Tippu Drop and Horse way which is a stone doorway at the northeastern side. The pride of Karnataka and the most popular place near Bangalore for monsoons, Jog Falls is the second highest waterfall in India and formerly known as Joger Gersoppa Falls. 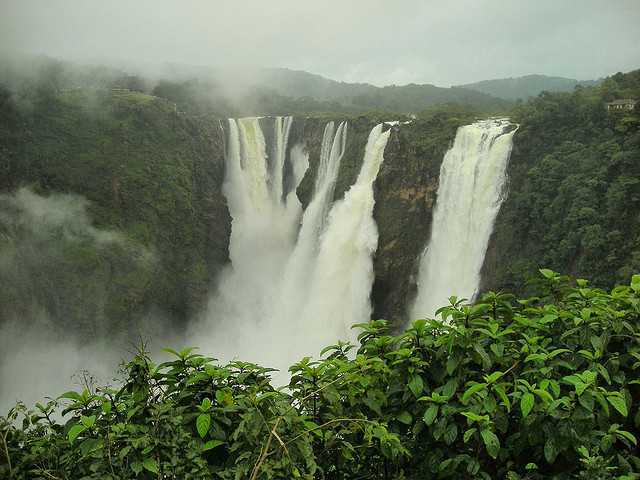 The Sharavathi River is in magnificent during monsoons as it cascades down the hill into four falls – Raja, Rani, Rover and Rocket. Also during this time, the dams of the rivers close by are let open on weekends causing a lot of water to gush through the falls. 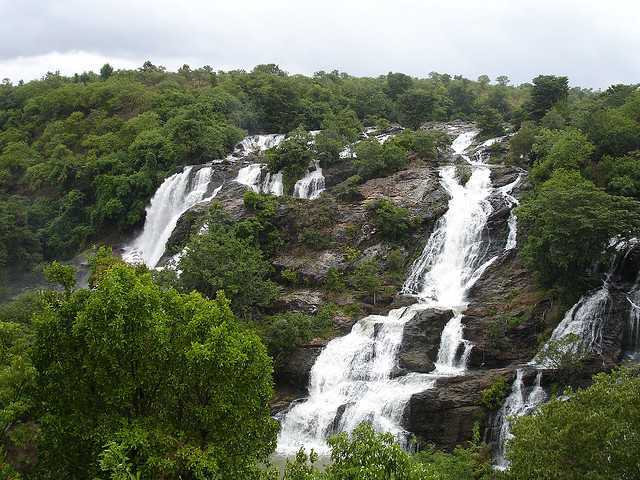 The Falls are located in Shimoga which is quite near to Bangalore; it is also the 7th deepest waterfall in the world. Apart from this the town of Shimoga also has a lot of other attractions on offer for a traveller like Mandagadde and Gudavi Bird Sanctuary, a couple of dams, Tiger and Lion Safari and much more.